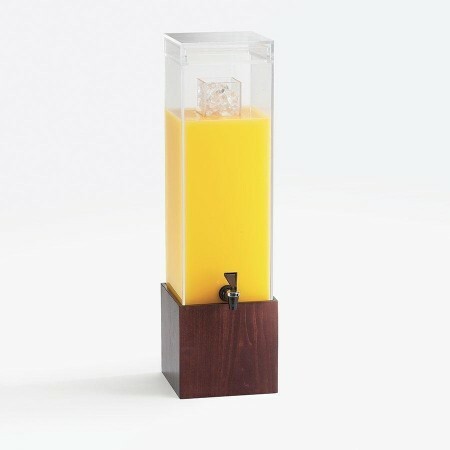 Serve your customers with refreshing lemonade, iced tea, or fruit punch with the Cal-Mil 1527-1-52 Westport Dark Wood Acrylic Beverage Dispenser with Ice Chamber 1.5 Gallon. Designed with a crystal-clear, lightweight acrylic container, this exceptionally durable dispenser captures the look of glass while providing optimum visibility. Thanks to its attractive dark wood base, this premium quality piece adds a rustic touch to your buffet set up. Stylish and functional, this BPA-free dispenser has a removable ice chamber to keep drinks ice cold for a long period while its easy-to-use spigot ensures quick and convenient filling. Perfect for use in fast-paced, commercial settings, this beverage dispenser comes with a drip tray to minimize mess.